Do not use the vanity mirror while driving. Keep the vanity mirrors in the sun visors closed while the vehicle is in motion. Reflected glare can endanger you and others. 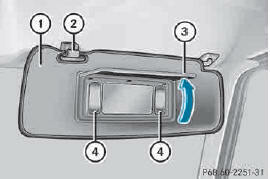 Mirror lights 4 will only function if sun visor 1 is clipped into bracket 2. ► Fold down sun visor 2. ► Fold up mirror cover 3. Mirror lights 4 are switched on automatically. ► Fold down sun visor 1. 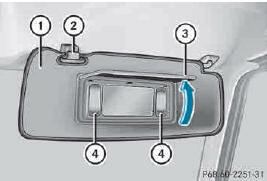 ► Pull sun visor 1 from bracket 2. ► Swing sun visor 1 to the side.